Below our Artistic Director, Emily Gray gives us her take on what has been a very busy and diverse month of workshops and residencies. In every week of June, I delivered workshops and residencies using Trestle’s new Half Masks, from Cambridge to Glasgow to Ipswich; in my twenty years of theatre work, I have perhaps never had such a varied month. I travelled from a struggling new secondary Academy in the Fens to a school for severely disabled young people in St Albans, from a prep school for the highly privileged to a college just establishing a sixth form and teachers working across a wide range of Scottish schools. Participants from the age of six to sixty have been grasping the skills needed to bring Trestle’s half masks to life both physically and vocally, singing in the style of a hero, dancing like a trickster, improvising as a witch. There has been laughter at the playful brilliance of the masks, astonishment at how the most unlikely students create stunning masked characters, tears of panic from those who find the masks alien and smiles of joy as they overcome their fears and discover the liberation that performing in a half mask can bring. At The Royal Hospital School in Holbrook, a sunny day in the grounds overlooking the beautiful River Stour, an ambitious Trestle Residency during which, in a day, 100 primary aged children created a telling of The Snow Queen through Indian Physical Theatre techniques and Trestle Half mask archetypal characters. The children performed with energy and imagination, creating choral masked characters and physical storytelling – five girls became an elephant, twenty children were a boat that disintegrated in a storm, a line up of boys played a many armed trickster. At Cambridge Junction a group of BTEC performing arts Year 12 (aged 16-7) students had a week to learn Mask and Physical Theatre techniques, create a piece and plan how to integrate the Junction’s disability arts group into it. The group found a way to mix Trestle Full Masks, Half Masks, Indian Physical Theatre techniques, fans and rhythmic work influenced by flamenco into one performance piece. The masks caused extreme reactions, they were loved and loathed, with one young man astounding his tutors with brilliant mask work and physical expressiveness which had not before been revealed and one young woman only daring to wear a mask on the last day of the week, just in time for the performance sharing. In St Albans, a group of boys (aged 11-14) from St Columba’s College came to work with a group of disabled secondary students at Watling View School. Over three days they worked together to create their own versions of the half masks and their characters and worlds. Such creative care was shown as St Columba’s students were inspired to develop actions and stories from the movements and habits of the Watling View students; the Hero just couldn't stay still, he was continually dashing off on new missions, the Fool loved to feel the bridge of his mask’s nose and this became of symbol of remembering to apply sun cream. The theme of our residency was ‘Being Brave’ and our Princess inspired us all by being brave enough to offer to dance with the Witch and find a shared love of movement. The King loved to drive the bus to Watford Junction, but when his gold was stolen he needed help and the other characters helped him to retrieve his gold from the Devil and Trickster, who guarded the gates of Hell with a golden key. The King then demanded that everyone in his kingdom dance to Gangnam Style, including the staff and parents who came to see the show. Meanwhile, in the same week, Year 8 pupils (aged 12-13) at Beechwood Park School were giving their annual Shakespeare Festival an almighty shift in style by introducing half masks to the Seven Ages of Man speech from As You Like It. Twenty Four students in half masks created a telling of the Seven Ages speech, delivering Shakespeare’s words and improvising around them to great comic effect and the delight of an audience of parents, peers and teachers. Up in Glasgow, over 70 teachers gathered for a day of professional development and I led group of 20 learning about teaching full masks in the morning and half masks in the afternoon. An unforgettable improvisation involved a wild Child desperate to find her real Father and a Mother trying hard to understand and appease the Child, whilst trying to evolve a relationship with ‘Daddy Number 5’ who turned out to be a bit of a Trickster. 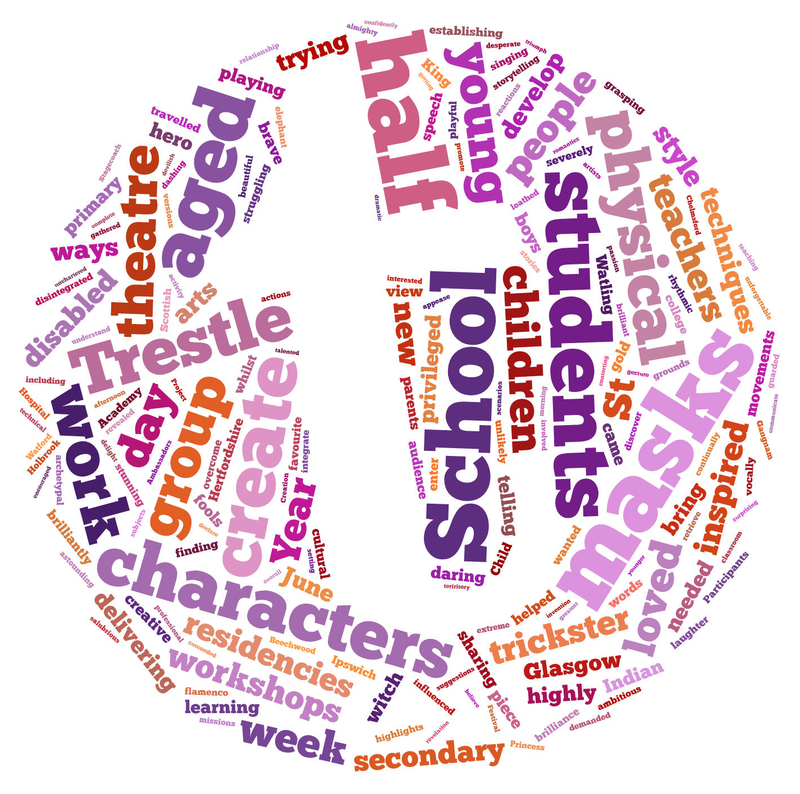 There was no shying away from the issues that can enter the drama classroom and suggestions of playing out scenarios through masked characters. Perhaps the most salubrious setting in which the masks have found themselves this month, was the Crush Bar at the Royal Opera House. The masks and I felt privileged to be at the launch of the Hertfordshire Young Cultural Ambassadors Project, led by Herts Creation, with primary and secondary students from across Hertfordshire being inspired to promote and develop creative and cultural activity between schools and artists. Some young people were interested in theatre and dance, whilst others had more of a passion for music, visual and technical arts. Many tried out the masks and imagined ways for them to engage students across all sorts of subjects. My last workshop of the month was with Stagecoach Chelmsford, a brilliantly run school with strong teachers and talented students. The greatest revelation here was six and seven year olds getting into half mask, finding ways to communicate through body shapes and contorting their mouths into highly dramatic expressions. The younger children improvised brilliantly, creating devilish characters who wanted to boil people, romantics who wanted to declare their secret loves, fools who thought they could win any game. I have been inspired and encouraged by the spirit of those people in workshops, whether they are children or adults, who leap up and try out a half mask, daring to be the first to put on a mask and enter the uncharted territory of improvising with me and on the spot finding a favourite word or gesture. My favourite moment is when they come out of the mask with a look of triumph that they have just made an audience react and laugh and believe in their invention and complete relief that the mask is lifted, they have succeeded and they can confidently say that it was fun, sometimes a bit weird, always surprising and overall liberating. Trestle prides itself on delivering bespoke packages for Arts Weeks, Activity Days, Curriculum Support, Corporate Training and anything else you may require. 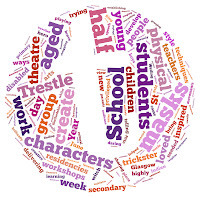 If you would like more information on our participation programme please visit www.trestle.org.uk/participate/ or email takingpart@trestle.org.uk.